Little ankh earring studs. 1 cm. 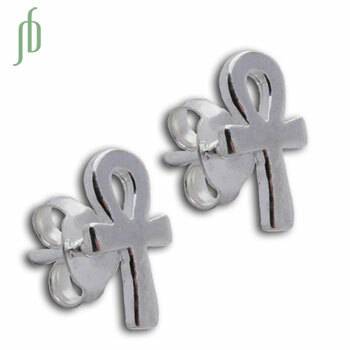 The Ankh is an ancient Egyptian cross and a hieroglyphic letter meaning "eternal life". Sweet ankh charm with a clasp so you can add it to most of our necklaces, bracelets or anklets to make your own ankh jewelry. Sterling silver cut-out cross charm. This tiny pendant is part of our charmas line. It is a 1 cm charm with a lobster clasp to make it easy add to your charm bracelet or necklace. Compassion. Sterling silver buddha earrings (buddha stud earrings) can be worn by men, women or children.